Starting in 2007, we coordinated a Veterans Memorial Project to honor all veterans, especially those from Sound Beach who died for their country. 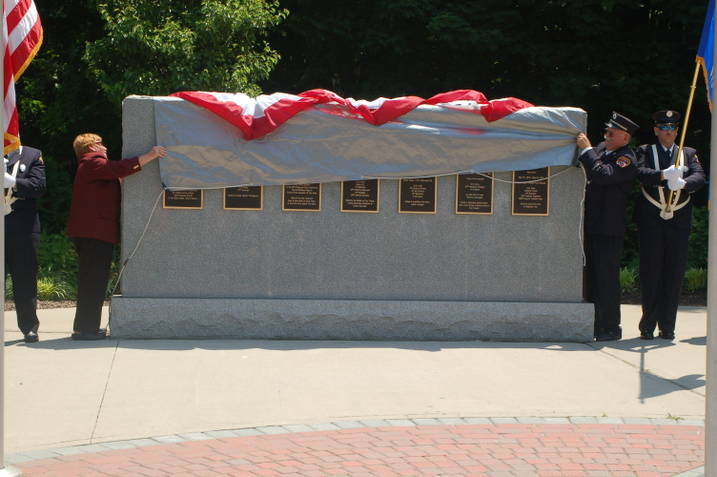 In cooperation with the Town of Brookhaven, Suffolk County, and New York State, we secured financial aid in the form of grants from Suffolk County and New York State.In 2012 donations from the community allowed us to purchase the bronze plaques and engrave the granite wall. Without the cooperation of all, this lasting tribute would not have been possible. Six flag poles, a granite memorial wall, a bronze plaque for each KIA, benches, pavers in the shape of a rondel (the insignia on the side of US military planes), and landscaping have been installed. On Memorial Day 2012, we formally dedicated the Memorial with many family members of the KIAs attending. Memorial bricks that will be installed on-site are offered for sale to the public to honor the memory of friends, loved ones, and veterans. (Download a Memorial Brick Order Form.) Profits from the commemorative brick purchases go to defray Memorial consumable expenses. We ask all to help us in this mission. We gratefully thank all the volunteers that have contributed to the memorial thus far, in particular Rich Brons of Brons Landscapes, who donated time, materials, and manpower installing and maintaining the landscaping. Each Memorial Day and Veterans Day we come together to honor the sacrifices that our Veterans have made to ensure the freedoms we enjoy. The ceremonies include performances by students from both our high school music departments and appearances by our federal, state, and town elected officials. We hope you will join us.